Sally Moomaw, EdD, is an associate professor of early childhood education at the University of Cincinnati. Much of her research and teaching is in the area of STEM (science, technology, engineering, and math) education. She received her doctoral degree in special education from the University of Cincinnati in 2008 following a long career as a preschool teacher and as the associate director for professional development at the college’s Arlitt Center. She is the author or coauthor of fourteen books on early childhood curriculum, including the More Than series, Lessons from Turtle Island, and Teaching STEM in the Early Years. She designed a Mathematics Tool Kit for the Ohio Department of Education to help teachers implement state content standards, and has presented numerous workshops for colleges, school districts, and conferences throughout the country. She also holds a bachelor’s degree in music and a master’s degree in child development, both from the University of Cincinnati. The transition into reading and writing occurs naturally when young children are surrounded by opportunities to interact with print. Intentionally help children develop literacy skills through hands-on, play-based activities. Age focus 3–6. Softbound. 400 pages. 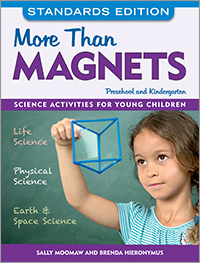 Take the uncertainty out of teaching science to young children with this comprehensive curriculum framework that aligns with the Next Generation Science Standards. Enjoy over 100 interactive play-based activities that encourage children to explore their world. Each of these hands-on activities includes background scientific information for teachers, a guide to implementation, and children’s typical responses. 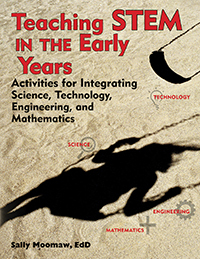 The foundation for science, technology, engineering, and mathematics education begins in the early years. Teaching STEM in the Early Years provides more than 90 activities and learning center ideas that seamlessly integrate STEM throughout your early childhood classroom. These hands-on STEM experiences enhance cooking, art, and music activities, block play and sensory table exploration, and field trips and outdoor time. Information on assessment and early learning standards is also provided.